I've hinted the past few blogs about a decision I made about improving my state of mind, and in particular my loneliness. Last night I took the plunge and ... I adopted a pet hedgehog. This might be a total shock to you. I only told a few people about this, because I wanted to be sure I was doing it for the right reasons, and I was sure I really wanted to take on the responsibilities of pet-ownership. After some thinking and quite a lot of reading, I decided to get one. Last night, Tab accompanied me to E-Mart at Wangsimni station to get one. 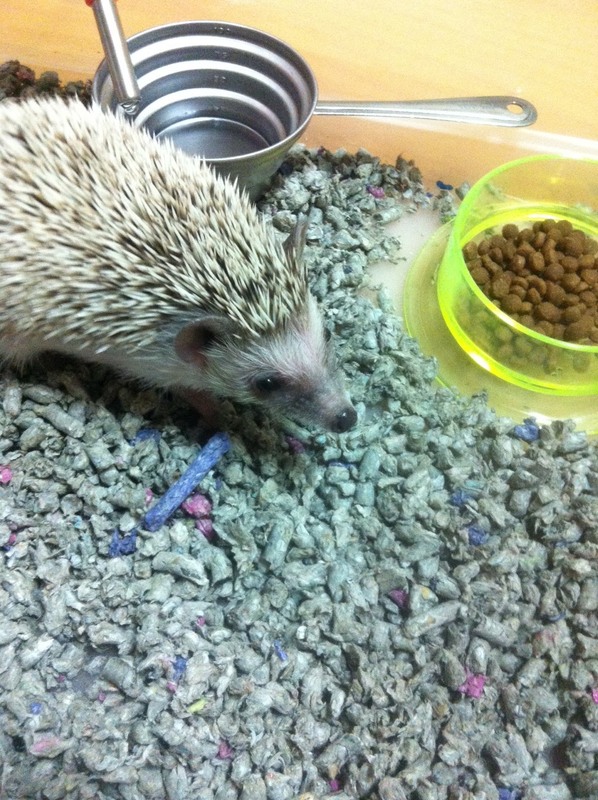 They had about 5 hedgehogs in their pet section. 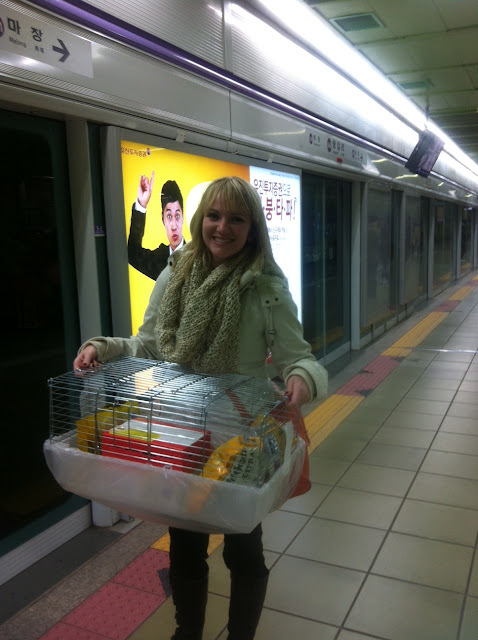 Other animals were birds, fish, hamsters, chinchillas (I think... names were in Korean), rabbits, turtles, and lizards. There may have been more, but I was focused on my hedgie and only saw what was in the immediate surroundings of my new baby. I had to ask all my questions to a guy who was kind enough to translate between myself and the employee of the pet section. 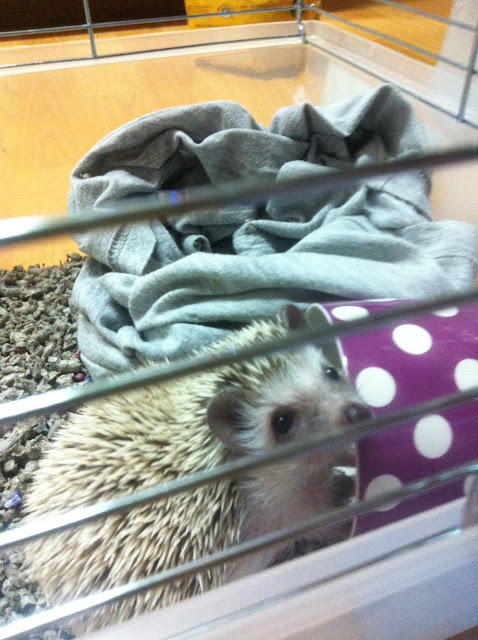 He let me hold one of the hedgies while I asked a few questions, such as How is it's health? Does it eat well? Is it friendly? How old is it? What is the gender? etc. I was holding a 2 month old girl, and she was pretty scared of me. I peeked in the cage again and for some reason my eyes went to a bigger one. I asked how old that one was, and they said 1 month older than the one in my hands. I asked to see it, and they told me it was a boy (my preference) and it was the friendliest. The poop was kind of green and not firm, so I asked again about its health. I did not want to adopt a sick hedgie! They said it was like that because he was scared and it was almost involuntary (think: puppies peeing when someone new pets them); since it wasn't actually time to poop, it was not as solid or normal. Mildly reassured, they put him in a box with some bedding and got me fixed up with a cage, water bottle, some bedding, and some food. I wanted a wheel, but they said they didn't have any. I found that strange since they sold many kinds of small animals that enjoy wheels. But, I was overwhelmed with excitement so I just went to check out. I was kind of surprised at how little they asked me before I bought him, and how little they told me about caring for it. But, since I bought him from a store rather than a breeder, I guess I shouldn't be surprised. I had read that they are pretty expensive, so I was expecting around 150,000W for the animal plus another 100,000W or 150,000W for the accessories and essentials. He ended up being 80,000W and with all the other things, he came out to about 145,000W total. Not nearly as bad as I was expecting! After I officially decided on which one, he needed a name. I've had one in mind since I decided to get one. He became Reggie. Tab helped me carry the cage and everything in it down to the subway and to my apartment. I felt pretty bad for the little guy, since they are sensitive to sound. I knew the subway was probably terrifying to him, but I didn't have much other option. Once I got Reggie home, I got the cage set up with some bedding, one of my old sleep shirts (so he can get used to my smell), his water bottle, some food in his dish, and a coffee mug turned on its side as a hide hole. Now it was time to transfer him from the box to the cage. I was pretty nervous, since he was understandably shaken from the subway and bus rides. I reached in and let him sniff me a little, but if I got anywhere near him, he quilled up. I tried the way the guy at the store did it, reaching under his soft belly so the quill wouldn't stick me. It worked okay, and I had him out of the box, but as I started to move him over the top and into the cage, I could feel him start to tense and get his quills up. I hastily finished the transferring process, and plopped him down. He did a lot of sniffing around and I kept letting him smell my hand a little. Since the guy at the store said he was very friendly, I really wanted to be able to pick him up. I was pretty nervous about getting a quill, so (a la: growing up with dogs), I let him sniff my hand. He started to put his paw in my and as he sniffed, so I was growing hopeful. Then... CHOMP! Reggie bit me!!!!!! And I guess I hadn't realized, but hedgehogs are not nippers like dogs; in the wild, these things hunt insects. And to get the little bugs, when they latch down, they don't easily let go. I was so shocked, I pulled my hand up (instinctively) and he went flying! Thankfully he came to his senses about 6 inches into the air and let go to tumble back down to the cage floor. I was certainly shocked! I knew they could bite (they have teeth, duh!) but, I read that you can kind of tell when they are about to bite because they will give you warnings, like hissing or clicking. He wasn't doing any of that before he decided to bite. His bite just barely broke the skin, but I washed it and covered it in Neosporin anyway. Needless to say, after that incident, I was very very reluctant to go near him. I decided to let him have some peace and settle into his new home for the night. After making sure he had an old sleep shirt of mine to rest up in (so he can get used to my smell), I went to bed. Before I could fall asleep, I started to panic. I called mom and made her reassure me that I wasn't an impulsive fool to buy this little guy. I mean, what if he never gets comfortable with me, never likes me, always bites me. What if he has a lonely boring life because we are always scared of each other? I mean, I'm now responsible for this thing! She reassured me that it's a feeling most new pet owners get at the beginning, and I can't expect him to love me right off the bat. The knots in my stomach relaxed slightly and I finally got to sleep around 2am. Around 4am, I woke up to Reggie shuffling around. My instinct (again, from a history with dogs) is that noises mean something is wrong. Half asleep, I mumble words of comfort and pull his cage right next to my bed. I'm sure he got all defensive, but since I could barely open my eyes I'm not sure. Around 7am, I turned on the heater in the apartment to make sure he was warm enough (they shouldn't be in a room less than around 70 degrees). When I woke up fully, around 10:30, he was asleep buried in my shirt. I watched YouTube videos about hedgehogs and how to make them trust you for like an hour before calling mom again to ask again if I was a fool. While talking to her, we decided that I need to get out and buy him some accessories: a wheel, a hide hole/house, and maybe a warming pad for his cage. I freak out a little bit that I don't really know where to find these things! Numerous google searches didn't turn up much of help. He was still asleep, and therefore I couldn't play with him or try again to hold him, I headed out to search in my neighborhood for any pet shops. I vaguely remembered some kind of vet or pet shop at the main intersection by my apartment, so I headed in that direction first. After about 15 minutes, I walked by the VIP Vet Clinic. I walked in to ask if they treated Hedgies and if they sold their accessories and/or where to go if not. After showing a picture to the non-English speaking desk assistants, they scurried to the back. When one returned, he told me that "teacher coming." Alrighty. I waited maybe 10 minutes, played with one of the other secretary's sweet baby poodles, and browsed their pet supplies (nothing for small animals). Finally, a beautiful Korean woman in her 30s (I'm guessing) came out and greeted me in nearly-perfect English. I was so delightfully surprised! She welcomed me into her office. I started out by asking if her office treated Hedgies. She said that they do, but for some things they recommend an exotic pet vet in Gangnam. She said that they can do general checkups and shots/preventative medicine. I then asked her about getting paperwork to take him back to US (certificate of health, etc), and she indicated that the exotic pet vet actually specialized in that. Finally, I asked if she could recommend anywhere to buy supplies for him. I could tell she didn't want to recommend it, but she did say there was a street where they sell lots of pets and that they probably have supplies. I had heard of the street she was talking about and I understood her reluctance to tell me about it; think overcrowded, dirty cages and little to no love or affection. As a vet, of course she wouldn't want to recommend giving those kinds of operations any support. But, that seemed like the only place to go. Together with her internet searches and my Subway app, we figured out the directions and I wrote down the information about the supplies as well as the exotic pet vet. I thanked her many times and still now feel overwhelming gratitude. I'm sure she is a busy doctor with many things to do, but she took time out of her schedule to walk me through (in English!) how to get what I needed for my hedgie. I got tears in my eyes just thinking about what a blessing she was. If I hadn't been able to ask her, I would have wandered around aimless and probably gotten very tired and frustrated. After getting the information from her, I headed to Hoegi station via bus (not my usual home station, but one on the same line as my ultimate destination: Dongmyo. I eventually got there and headed out exit 6. I wasn't sure exactly where to go, so I just walked straight. Eventually I came to a main road, turned right, and there was about a quarter mile of pet shops chockablock, crammed with tons of animals. I saw ground hogs, chipmunks, rabbits, hedgehogs, birds of MANY varieties (even some roosters and chickens! ), tons of fish, lizards, turtles, etc. It was really kind of sad, since there were usually way too many in each cage/tank. I eventually located a wheel that looked sufficient in size and material, and got him a little house to hide in. The seller even threw in some mealworms for free (supposedly a hedgehog's favorite treat). I headed home and was pretty exhausted by the time I returned. When I got back, Reggie was back in the shirt, but moving around enough that I could tell he wasn't asleep. I decided to try to pick him up with the shirt as well, so as to avoid being quilled. The videos I'd watched this morning had inspired me to try again, and reassured me that biting was rare. I gathered him up, and once he unspiked his quills, I rose him into the air. He was awkward for sure, kind of trying to escape. Eventually I got him turned the right way and kept talking to him and being sweet. And you know what he did? He BIT the dang shirt!!!! I was so mad! If I hadn't been hesitant and used the shirt, that would have been my dang hand he bit (again!)!!!!! Annoyed, I put him back in the cage. I think he was grateful. I put his new house inside and his wheel as well. He hissed when I got near him and I just left him alone after putting some food in his dish. Eventually, about 30 minutes later, he got up the courage to check out his new wheel. Once he figured out that it spins, he hesitantly got inside. It was actually hilarious to watch. After some trial and error, he finally got the hang of it. I knew he was comfortable on the wheel because he promptly pooped in it. I'd read that they like to poop on the run (natural instinct). Now, I've been letting him do his thing for a while. He is asleep now, and I just cleaned his wheel (first time of many to come). Honestly, I'm not sure if we're right for each other. I want to love him and I want him to love me, but he is so scared! I know it can take time, but it's just that everything I've read online seems so much easier than this specific little guy. Like, "they rarely bite and when they do, it's preceded by various signs"... Um, false. Maybe my guy is just a "biter". If that is the case, I honestly don't think I want him. My whole mission was to get some company. If he is going to keep biting, that's not the company I want. You may be better served by quickly returning it, and getting a more docile one. In my observations hedgies do normally give some indication when they rarely bite. Chelsea, get a kitten! All the love you could want. Easy care. All you need is food and kitty litter! That's what I think too! Just give him time to adjust. I know I bite the first few time I meet you if you scare me. Maybe Reggie is a vampire in hedges clothing! Oh, no - impossible! Think you do have to give him a bit more time; when he discovers the origin of mealy worms, he will be very happy. And so will you! Congratulations on becoming a "mom" to a little guy who needs a loving home. That's a "good thing". http://www.animalrescuekorea.org/forums/showthread.php?t=4286 this site is where i found my veterinarian. i dont remember where i found out about taking him home, but a good google search should turn something up. i think the vet could also give you some good information about taking your hedgie home and provide you with paperwork to help!